The IAMR Group constitutes four different institutions offering programmes in Sciences, Health Care, Management and numerous disciplines of Engineering. We are a self financed, vibrant, young group of institutions established to meet the aspiratious of the youth in the foregoing areas. While the sciences, health care and management institutions are located on Delhi – Meerut highway, the Engineering colleges are located on Meerut-Bagpat road in lush green sprawling campuses. We equip our students to face the challenges of industry and society with multi-tasking skills through multidisciplinary education. We deliver integrated curriculum that consists of diverse set of courses, project work, seminars, laboratory work, etc. We encourage regular interaction with the industry and focus on all round development of the students. Intimate us a week in advance the details of your pre-placement talk, interview/written test programs. Sent us in advance in details of your recruitment requirement and company snapshot/profile. Promptly instruct us about sending CVs electronically to facilitate interaction planning. Inform us in advance the selection criteria and recruitment policy of your organization to enable us to shortlist suitable aspirants for you. Route offer letters to the selected students through the IAMR Group for Corporate Relation Office to expedite joining and enable efficient tracking of the Placement programme. After completing the first year of the programme students are required to undertake summer training project in industry for 8-10 weeks. This training helps students to have a firsthand experience of working in real-life settings of industry. Campus: The IAMR Group constitutes four different institutions offering programmes in Sciences, Health Care, Management and numerous disciplines of Engineering. We are a self financed, vibrant, young group of institutions established to meet the aspiratious of the youth in the foregoing areas. While the sciences, health care and management institutions are located on Delhi – Meerut highway, the Engineering colleges are located on Meerut-Bagpat road in lush green sprawling campuses. We equip our students to face the challenges of industry and society with multi-tasking skills through multidisciplinary education. We deliver integrated curriculum that consists of diverse set of courses, project work, seminars, laboratory work, etc. We encourage regular interaction with the industry and focus on all round development of the students. The Science and Health Care (Physiotherapy) programmes have made a mark for themselves. The PGDM programme has earned the laurels of Business & Management Chronicle research team and has been placed at the 11th position among many institutions of NCR. The IAMR College of Engineering offers courses in most popular disciplines. 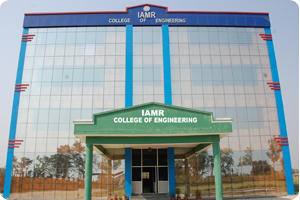 The IAMR college of Engineering, Meerut enjoys the distinction of admitting students both from GBTU as well as AIEEE. It is the only Private institution which admits students directly from AIEEE. Central library: The pride of the Institute is the modern digitized library which houses large volume of books in the areas of engineering, applied sciences & humanity. Library is the hub around which all academic activities of the Institute revolve. It has seating capacity of more than 100 students. It also houses reprographics facilities. The library subscribes to a large number of national and international journals, including e-journals. Magazines on current affairs and general interest are subscribed. Hostel: The Institutes have separate hostels for girls and boys. The rooms are spacious, airy and well furnished. The mess functions under the control of the students and they have considerable choice in deciding the menu of their meals. They have enough freedom to live independently but each one of them is required to strictly follow a code of conduct so that all the inmates live like a ’joint family’ and have strong ‘we’ feeling.